Have I told you lately how much I love L.A.? Well, I do. A lot. I feel giddy every time I discover a new part of the city, especially one that’s nice to my wallet and even nicer to my taste buds. The Astronomer and I were recently introduced to Little Tokyo by our friends and long-time Angelenos Andrew and Miri. After a recent religious experience with a bowl of Daikokuya‘s tonkotsu ramen, Andrew insisted that we meet there for dinner. Upon hearing that piggy back fat was the key ingredient in the broth, all I needed to know was when to show up. 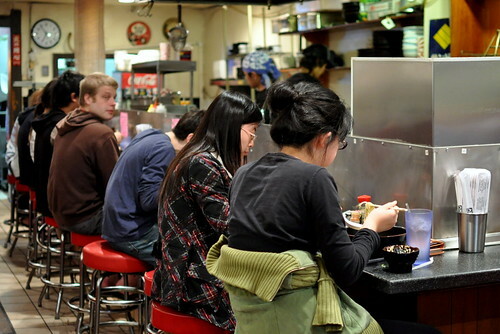 With a firm no reservations policy, Daikokuya is notorious for having tortuously long waits. We hedged our bets by showing up somewhat early on a Sunday night. After twenty minutes of chilling under the restaurant’s yellow awnings, our party of five was led to a plushy red booth. The dingy dining room was warm and humming with happy slurpers. 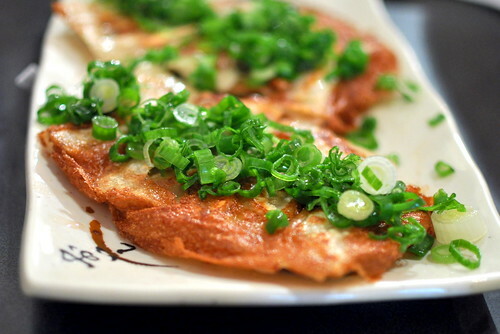 A ramenya experience is incomplete without a few plates of gyoza ($5.95) to start. The ones at Daikokuya are filled with pork and vegetables, wrapped in thin papers, and pan fried. An order includes five dumplings that arrive in a raft-like mass, accompanied by a mild dipping sauce on the side. After carefully peeling a dumpling from its mates, Andrew declared the gyozas the best he’s ever tasted. I would’ve shouted out in agreement, except that my mouth was occupied by a plump little dumpling. For our main course, The Astronomer and I shared one of Daikokuya’s combination options that included a cabbage slaw, a bowl of ramen, and a small teriyaki eel bowl ($12.95). Daikokuya’s broth is made using simmered kurobuta pork bones, as well as extra back fat (kotteri) upon request. 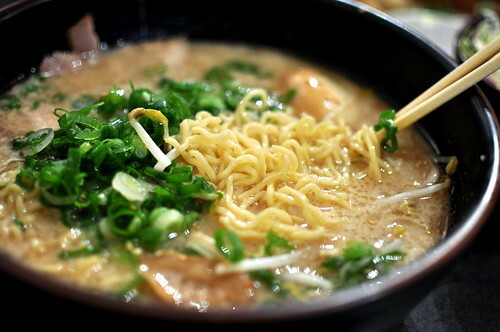 The broth was thick, milky, and luxurious, while the noodles were curly and springy. A couple spoonfuls of finely minced garlic and florescent pickled ginger balanced out the bowl to perfection. The unagi bowl was straightforward and delicious. Truly, what’s not to love about buttery eel painted with a sweet glaze? 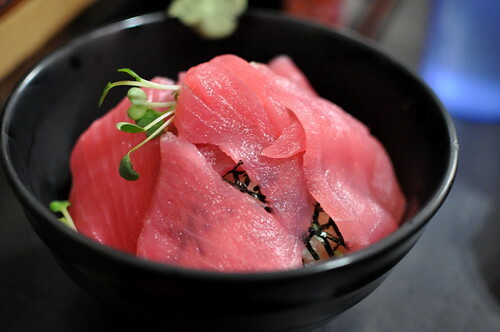 And because The Astronomer was feeling extra hungry, we also ordered a tuna sashimi bowl ($10.95). The slabs of fish were just thick enough and unquestionably fresh. We enjoyed having the tuna’s clean flavors to contrast the ramen’s avalanche of porkiness. It took a while for The Astronomer and me to make our way to Little Tokyo, but now that we’ve had a proper introduction, there’s little doubt that we’ll become regulars. I still need to visit myself! i love this place. glad you like it too! You’re just now discovering Little Tokyo? Giiiiiirl, you are gonna have so much fun! You’re new to Lil Tokyo? You HAVE to try Wakasaya! It’s a donburi or rice bowl chain from Japan. Bowls of fresh quality uni, unagi, ikura, toro… It’s big quantities and worth the price! I should really visit little Tokyo more often. It been awhile since I had a good bowl of Japanese ramen. 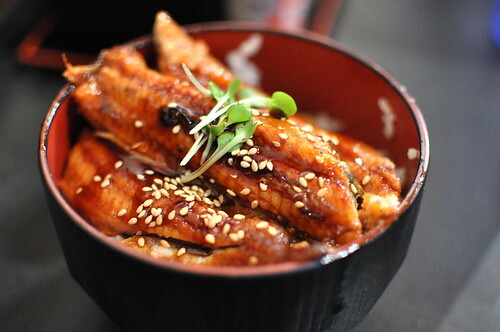 That unagi bowl looks great too! Ugh! In a few weeks, I will absolutely break from my current low-carb regime with a visit to Daikokuya!!!!! this is my bf’s fave ramen spot, he first took me here on a date! love it! great pics! Maybe I’ll even spring for some back fat! Um, now I have to try Wakasaya. Thanks Dorothy for the tip! I cannot believe I’d been to Daikokuya before you! That’s amazing. Glad you enjoyed it. I am going to Shinsengumi for lunch. YIPPEE!! 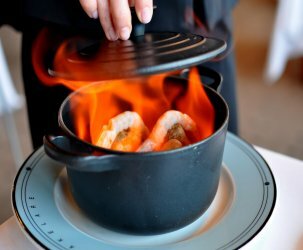 i often want to run to the restaurants after reading your write-ups, but i think this one has made me want to more than any other! I haven’t had a good experience at Daikokuya, so I usually opt to go to Chin Ma Ya just down the street. Glad you liked it. Sarah – You will love! Daikokuya is so wonderful. Chin Ma Ya is…not. 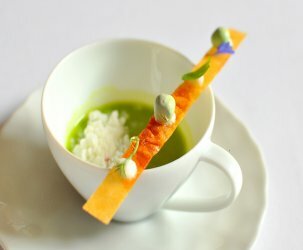 Love their fatty broth. 20 min wait wasn’t bad! How is it I work downtown and you beat me here? (I’ve had three aborted attempts to go) Stupid job! Glad you tried some other non-ramen stuff. I was curious. Gonna see if I can hit up Jo and go together! 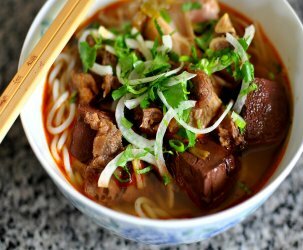 Cathy – have you had Santouka’s ramen with “special pork” (specifically, the Santouka in Costa Mesa)? If so, how does it compare to Daikokuya? Haven’t tried Daikokuya yet, but I do LOVE the toroniku (“special pork”) at CM Santouka. Melts like buttah on your tongue! Good noodles and milky, flavorful broth, too. I enjoyed my first few bites of Daikokuya’s ramen, but, after a bit, it became way too much for me. I think there are too many rich flavors going on for my taste because both Justin and I were sick for a few hours afterwards…maybe not for the faint of stomach? Love it, I was going there every week for a while! The fried rice is great too! Your Daikokuya picture is at the front of EaterLA right now! 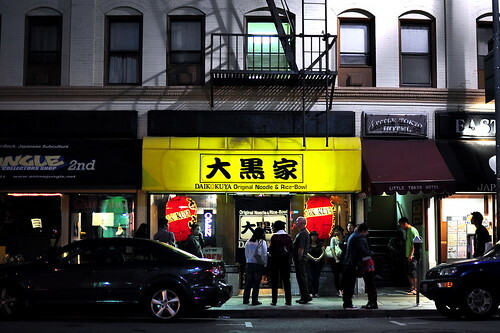 That looks like a promising quaint outlet for a bowl of tummy-warming ramen and some gyozas. It’s a pity we in Malaysia are not blessed with the abundance of such simple eateries. J2Kfm – Oh, but you have so many other goodies 🙂 Wish we had your street food scene!